Flank an entryway with delightful greenery using these Dura-Trel Sunburst Planter Trellises with White Lattice. This set of two planters and trellises brings a fantastic bit of style to your patio or doorway, thanks to their diamond-shaped lattice and crisp, white color. The two, Dura-Trel Large White Lattice Planters rest on any level surface, and 12" diameter pots rest inside them for easy planting. Pointed post caps on the front legs mesh with their latticework sides, and the square legs keep the item stable. Attach one of the included Dura-Trel Sunburst White Lattice Trellises to the back of each planter, bringing height and drama to your setting. An arched top and diagonal accent rods on each trellis create the sunburst motif, bringing a bright look to your setting with ease. The matching, diamond lattice on the trellises both blends with the planters and supports climbing plants, allowing their greenery to contrast the vivid white of the unit. Each piece in this wonderful package contains the greatest concentration of Titanium Dioxide available, which acts as a UV stabilizer. This ensures the hardy vinyl construction will not rot, warp, or crack, remaining protected from the harmful ultraviolet rays of the sun, and the pieces require little maintenance to remain beautiful. Showcase and support climbing vines or plants on your patio or deck with these Sunburst Planter Trellises with White Lattice. Assembly required. Made in the USA. Twenty year guarantee. 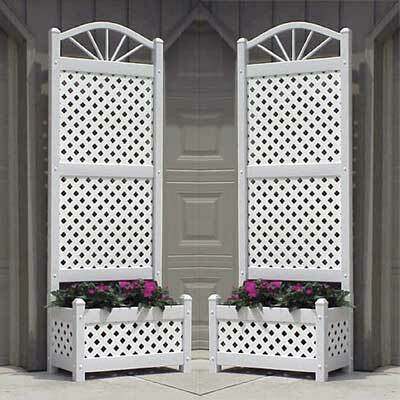 Note: This case pack includes 2 of the Dura-Trel Sunburst Planter Trellises with White Lattice, 78"H.